Come on down to our free August winter workshops and events! Fresh home made pizzas are best made on a wood fired pizza oven. Learn how to build one from blocks and clay sourced on our site. This is a great way to try the fresh produce that we have growing at the gardens …. pizza tastings to start in Spring! 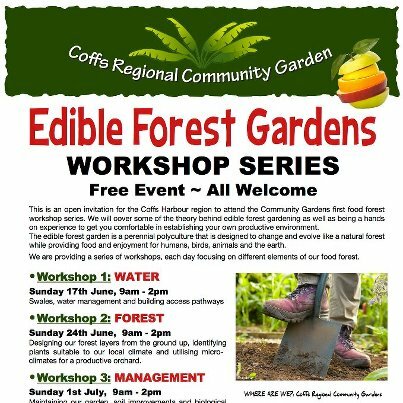 If you missed out on the Edible Forest Workshops in June here is another chance to be involved. We will be designing a second food forest from the ground up, identifying plants suitable to our local climates and utilising microclimatesfor a productive orchard. Join us at the Harbourside Markets on the Jetty Foreshores for this joint event between the Coffs Community Gardens and the Harbourside Markets. 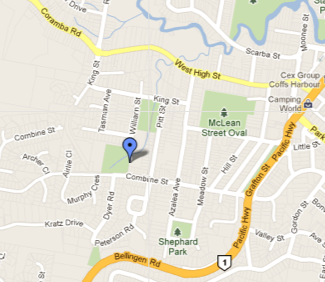 There will be heaps of gardening stalls, free garden guru advice tent, competitions and activities for the whole family. Wear your favourite gardening gloves and hat to win a prize! Revamp your old garden tools before the start of Spring planting. Learn how to bring your garden tools back to life with a few simple techniques. Bring along all the old tools from your shed. Raising plants from seed ~ September date TBA, watch this space! Spring time is here …. the perfect time to start raising plants from seed and cuttings. This will be a popular one folks! Come and join us for our last workshop of the year and learn how to easily grow bananas in your own backyard. Using permaculture principles, we will be building a banana circle in the Combine Street Community Garden and plant bananas trees as well as some good companion plants. 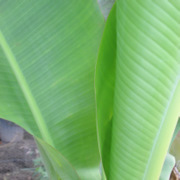 A banana circle is one of the easiest-to-build and most rewarding element of a permaculture garden. and of course, lots of FREE bananas year round! The 2011 Sustainable Living Festival has already started and Saturday 5th November is promising to be a jam-packed day of workshops and presentations. This session will cover garden layout, design and planting preparation. This session will cover plant selection, companion planting etc. Bookings essential via Jetty Theatre – Preparation or Planting Session. All participants must bring sunscreen, hat and enclosed shoes. The Our Living Coast Sustainable Living Festival is a community celebration of all things “sustainability” – with demonstrations, workshops, walks, presentations, children’s events and exhibitors – showcasing environmentally sustainable ideas, products, and practices to help us live more happily and healthily, in harmony with our surrounding environment. The key themes of the Festival this year are Climate Change and Local Food. Come and learn about how you can reduce your energy bills, grow your own food and make your home, your business and your life more green and healthy. And that’s just the start! There’ll be plenty of music and entertainment from our wonderful local musicians and performers as well as fantastic local food. 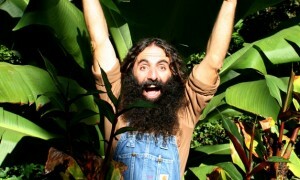 Additionally this year the Sustainable Living Festival will have two very special guests – Costa Georgiadis, host of the well known SBS series Costa’s Garden Odyssey and dirtgirl from the ABC kids show dirtgirlworld. As part of the festival there will be a series of in-depth workshops and presentations on Saturday 5th November, which will bring together local and regional experts to explore different aspects of sustainable living on the Coffs Coast. All this and more will be showcased at the Festival, kicking off Sunday 30th October with a wonderful local film night at the Bunker Cartoon Gallery, followed by the annual “Show us ya Dish” finale at the Grower’s Markets on Thursday 3rd November, and climaxing with the Botanica Spring Festival at the Botanic Garden all day Sunday 6th November.